Talk about the elephant in the room! For each of our excursions, we’ve told you that when all else fails, head to the Duomo to start your adventure. What we’ve neglected to mention is that the Piazza del Duomo itself is one of Florence’s top free outings. Maybe we’ve avoided it for so long because the piazza, as Florence’s central meeting square, is often packed with tourists crouching, jumping, and executing a crazily choreographed dance over the cobblestones to get the “perfect picture” of the sites. Problems here include (1) it makes it a bear to walk through, unless you have the agility of a Florentine gecko and (2) it’s hard to really LOOK at the incredible monuments when you’re shooting, posing, or avoiding. Our suggestion if you’re visiting at the height of tourist season? Head here first thing in the morning – the pinks, greens and creams look majestic in the morning light. Or, set up shop on the Duomo’s front steps with a gelato later in the evening (this is also prime people-watching real estate). 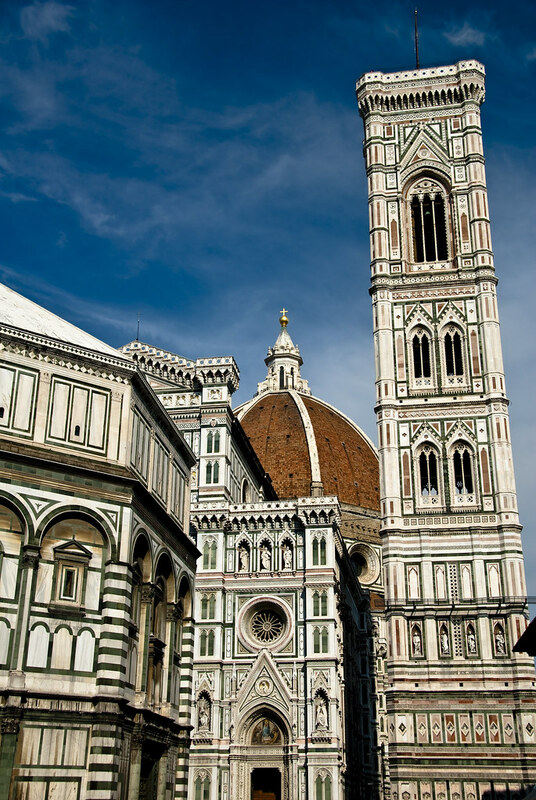 It all centers around Santa Maria del Fiore (the church), Giotto’s Campanile (the bell tower), and the Baptistery of St. John (the patron saint of Florence). Now there is a whole host of information out there on the well-known details of the piazza – we recommend this and this site to get your fill of historical facts. We won’t reinvent the wheel here, but we will share our list of little known facts (or more like commonly missed facts) about the Piazza del Duomo. 1. Florentines love contests: One of the first lessons learned upon visiting Florence is that the gold baptistery doors – the Gates of Paradise – are the indirect result of a hard-earned competition win by Lorenzo Ghiberti in 1401. Ghiberti originally competed to create the north doors of the baptistry. When those looked so good, he was then commissioned to complete the east doors as well, which turned out to be the very celebrated ones we all gawk at today. The detail often lost in this story is that Ghiberti won the original commission over Filippo Brunelleschi. Don’t feel too bad for the runner-up, however; Brunelleschi came out on top (quite literally) when he submitted the winning design for the cathedral dome in 1418. Who was the runner-up in that contest? 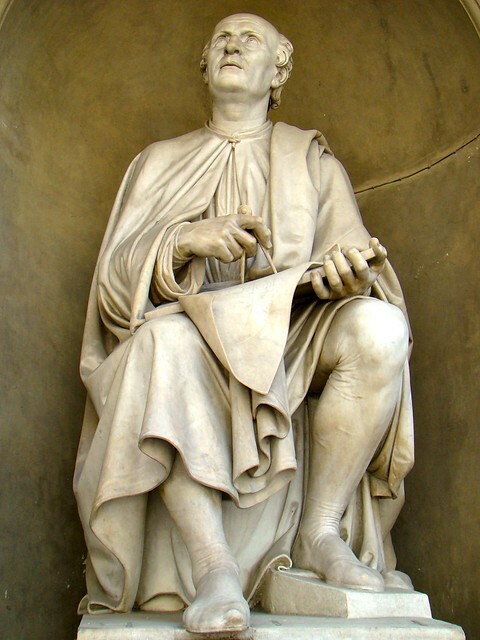 His old pal Ghiberti. Brunelleschi then had to prove his worth a third time to create the lantern that crowns the dome, again competing against Ghiberti. Nothing like a little friendly competition to help you make history. 2. On that note, those aren’t the original doors! : The real Gates of Paradise have just been returned to Florence after years of restoration hibernation. They are on display in the often under-appreciated Museo dell’Opera del Duomo, meaning that the doors currently in situ are (excellent) copies of Ghiberti’s masterpiece. 3. Brunelleschi is still a dome-gazer: When circling the magnificent cathedral, we admit it’s hard to do anything but look up. While we encourage walking around the space for a full 360-perspective of the main attraction, make sure you keep your eyes open to the supporting cast – like this statue of Brunelleschi on the far right flank of the church. He’s sitting there with his drafting compass making calculations for his dome. Although he died before its full completion, Brunelleschi is immortalized considering the project that consumed the last years of his life. 4.The dome decorations are unfinished: If we follow Brunelleschi’s eye, we’re led back up to the base of the dome, where on one side there is a narrow band. This balcony was supposed to circle the dome in its entirety, a project started by Baccio d’Agnolo in 1507. He finished only one panel before Michelangelo condescendingly quipped, “It looks like a cricket cage.” And thus ended Baccio’s balcony project. 5. The significance of the baptistery’s eight sides: The baptistery’s octagonal shape is significant to the Catholic practice of baptism. As we lowly mortals celebrate a seven-day week, Catholics concluded that the second coming of Jesus would logically occur “on the eighth day.” The baptistery’s eight sides reinforced to the public that it was their one-way ticket to the pearly gates at the end of time. 6. …But beware of pagans! : The baptistery is built on the site of what Florentines believed was a Roman pagan temple. To celebrate its storied roots (or to not-so-subtly convey the dominance of Christ over pagan faith), the baptistery was decorated with marble taken from ancient Roman structures. Christians, 1; pagans, 0. 7. Don’t miss the indecent angel: We couldn’t end this post without mentioning one of the space’s off-color characters. 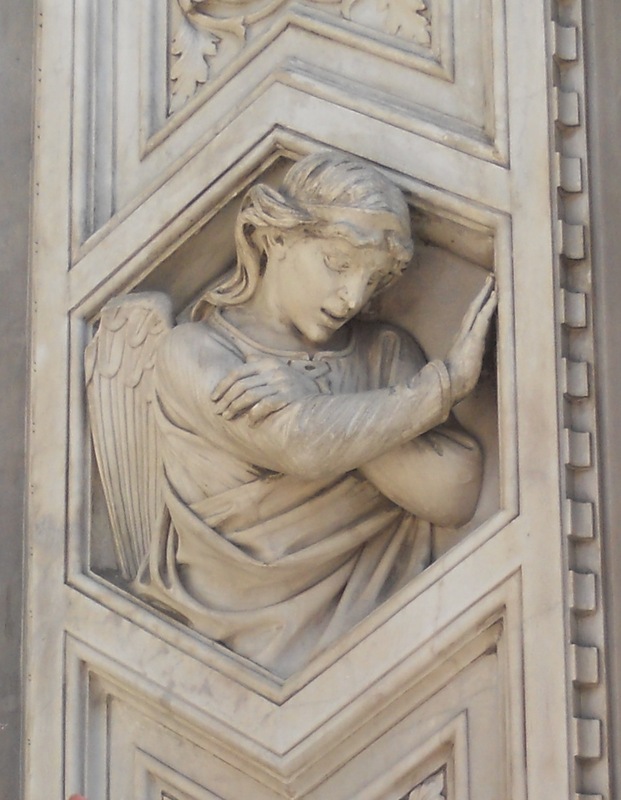 To the right of the Duomo’s far door, an angel could be caught blessing the city of Florence. The way his arms are crossed, however, makes the gesture curiously close to the Italian version of flipping someone off. Does he have the best of intentions or is it a crude prank? Probably a bit of both – seek him out and judge for yourself. 8. A miracle in the piazza: click here for the full story of how a Florentine saint brought a tree (and more than a few people) back to life. So that’s a round-up of some of our little known facts about the Piazza del Duomo. If you have any to add, post them in the comments so we’re all in on the fun. Next week, we’ll take you inside the cathedral (the only building here with free entry) for more interesting details on one of Florence’s most recognizable monuments. There actually wasn’t a contest for the “Gates of Paradise” doors. The contest was for the doors that are now on the north side of the baptistry. After Ghiberti completed those doors, he was given the commission to create another set of doors, those being the “Gates of Paradise” doors. hi shawn, thanks for the note! you’re right, the way it’s worded is misleading – we had tried to tighten up the story for brevity’s sake. we’ve tuned that section up a bit for clarity. thanks again for catching it!